A siren blares as a convergence of first responders’ vehicles remains positioned in a crowded parking lot. Scores of children are shrieking… but with delight. 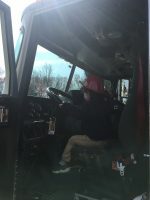 A touch-a-truck event comes to town and, although they may not yet realize the education at hand, toddlers, preschoolers and the next generation of American society are learning about the roles and responsibilities of their government sector. As a parent to a transportation-loving two-year-old, there are few better activities than one that allows my son to climb aboard a tow truck and school bus, to pretend to drive a fire truck and to sit in ambulance without needing medical assistance. Touch-a-trucks are exactly as they sound: occasions bringing enrichment to children through this first-hand experience of the magnitude and power of this technology. The trucks are adult vehicles temporarily repurposed as a playground for the youthful imaginations of the little climbers and pretend drivers. Touch-a-truck activities also offer a model of how government can and does serve the citizenry. Popular culture presents to children an idealized version of the work of police officers, firefighters and other critical street level bureaucrats. Board books and picture books do not depict the challenges of violence, power and biases in interactions amongst citizens and public servants. Often in these stories a friendly animal will assist with extinguishing a fire and police devote a sizeable portion of their day to locating lost goods, people or pets. In a small but significant adventure touch-a-truck allows children to place this fiction in a still sanitized reality. Touch-a-truck can be a first interaction with a city, state or federal official in his or her capacity. The concept of laws and governments as instruments of our society’s collective oversight and support is too abstract and unnecessary for small children to understand. On the other hand, it is never too early for kids to learn that there are people who work every day on their behalf to support the well-being of individuals, neighbors, and beyond. To meet these public servants is to connect with the community, and those who maintain societal safety and norms, on a personal level. The trucks also provide an opportunity to understand the role of the value of working together and shared objectives. Children may own their own toy cars and trucks, but a fleet of governmental vehicles requires the resources and responsibilities of groups of individuals. The massive construction vehicles, with wheels that dwarf the children, are monuments to the scale and complexity of building and maintaining public works. Touch-a-truck exposes the backbone of modern infrastructure to engage the children. In fact, as political leaders consider investments in roads, bridges, buildings and services to allow ourselves and forthcoming generations to have the structures that grow and maintain the economy of the twenty-first century and beyond, this type of event is a reminder to parents and onlookers in the vicinity of the role of government. Our tax dollars go towards improving the capacity to deliver health and safety services to the public, but we often only see those capabilities due to unfortunate circumstances. It is comforting to know that modern fire engines are at the ready without needing a real disaster or inopportune false alarm to be a firsthand witness. Citizens often do not see, let alone touch, the valuable and fundamentally important products that the public sector procures with its mandatorily raised revenues. Touch-a-truck is an entertaining inspection of the benefits of our tax burdens. In raising children in today’s social and political environment it is easy to lose sight of the daily role and responsibilities of public institutions, at least beyond the educational realm. Children naturally live in their small worlds and even adults have become increasingly isolated and disconnected from the fundamental physical manifestations of our communities. Whether it’s a touch-a-truck event, a government park or property, or even just in the public square, we all need to recognize and pass on to our children a value for the collective good. People can and do great things as individuals, but the backdrop and foundation of the services and opportunities afforded through a developed, protected and secured society allow us all to function better. Be it trucks, buses, buildings or bridges, within our social and virtual communities we possess and require tactile physical goods. The best part of touch-a-truck is the trucks. Trucks are cool. Trucks are fun. Trucks are useful. Trucks are also a piece of our government and society. Trucks are tools that allow us all to grow and develop into the best possible people. Letting our children touch these trucks can help them grow and develop into the best possible people to grow and develop the best possible future for our government and society. Author: Benjamin H. Deitchman is a policy practitioner in Atlanta, Georgia. His recently published book is Climate and Clean Energy Policy: State Institutions and Economic Implications. Dr. Deitchman’s email is [email protected] and he’s on Twitter @Deitchman. This is a great article and should be sent to all local and state governments. My only comment is that today technology in fire trucks and other public safety vehicles is critical and require skill levels much different than 1990 and before.